CORAL GABLES — As the words of praise and accomplishment were handed down from the podium, expectations rose at Connie Mack IV’s campaign headquarters in Coral Gables on Tuesday night. The four-term Republican congressman from Naples, fresh off his easy victory in the GOP U.S. Senate primary win over three relative unknowns, told the gathered crowd of supporters that, “this is just the beginning,” alluding to his upcoming battle with incumbent Democratic U.S. Sen. Bill Nelson, a 12 year veteran of Congress’ upper chamber. Mack won nearly 60 percent of the vote over former U.S. Rep. Dave Weldon, conservative activist Marielena Stuart and Mike McCalister, a retired Army colonel. “This is really where the campaign starts, where we have to bring everybody together and work as one team, make sure we have the resources and the people to get out the vote,” Mack said. Even in the context of a victory speech, Mack gave way to his party’s ambitions of a unified presidency and legislature, hinting of a future campaign staked in the vision of a dominated Republican tomorrow, a seat in the Oval Office and a Congress painted over red. “The most important thing we can do in Florida is make sure Mitt Romney is president of the United States and that he has a Senate that will stand with him,” Mack exclaimed to a guaranteed applause. There was nothing uniquely Floridian about Mack’s campaign or his victory speech. No mention of the oil drilling off the “pristine” Gulf Coast, which Mack himselfopposed in his younger days, only to support it in the strained days of rising prices at the pump. Instead, it was about Obamacare, regulations and containing the debt — issues his supporters view as the most dire for the state and the campaign going forward. “I felt that Connie Mack distinguished himself, especially after his votes the last couple of years, said Everett Wilkinson, chairman of the South Florida Tea Party.“It’s great that we have someone who is fiscally sound heading into the general election. “I think this could be key to Republicans getting the Senate in 2012. I think it’s critical that they get it,” he told Florida Watchdog. Mack’s office didn’t return requests for comment. The man Mack wants to replace in Florida’s U.S. Senate seat is incumbent Bill Nelson, who handily won his Democratic primary over marine biologist Glenn Burkett by more than 500,000 votes, taking in 78 percent of ballots cast in the only statewide race. 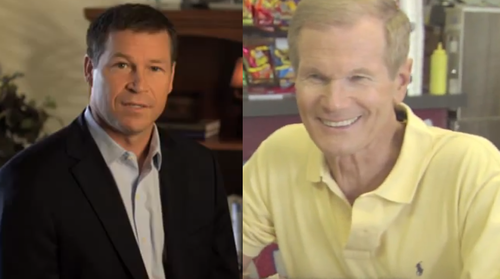 Nelson, a 40-year veteran of Tallahassee and Washington, D.C., politics, has crafted his campaign as someone who “exposed the lies of BP” and “stood up to the insurance companies and Wall Street banks,” preferring to “fight for Florida and education, Medicare and Social Security,” according to his latest ad. With third-party groups such as Karl Rove‘sCrossroads GPS ready to pour more than $6 million into Nelson’s defeat in November, because of his support for President Barack Obama‘s Patient Protection and Affordable Care Act, or Obamacare, the incumbent senator will be looking for many allies in the months ahead — a task which may not prove too difficult. As the NASA’s most ardent supporter in the federal government, Nelson has become a flag bearer of sorts for the proponents of state-subsidized spaceflight, as well as larger subsidies for defense companies at large. As revealed by an earlier Florida Watchdog investigation, Nelson, only the second sitting member of Congress to fly on a space mission, has proved quite busy in assigning earmarked federal spending for individual contributors to his senatorial campaigns —especially those involved in the aerospace industry. The political action committee of DRS Technologies Inc., an aerospace defense contractor based in New Jersey, has notably poured nearly a quarter millions dollars — $244,917 — into the senator’s campaigns for office in the past 10 years alone. In 2008-2010, Nelson personally earmarked more than $8 million for the company, the result of a large bidding war over parts distribution for the third-generation Bradley fighting vehicle, used by the U.S. and Saudi Arabian military and one of the most active vehicles overseas, according to the Defense Department. Nelson’s staff did not return calls to Florida Watchdog.